The prolific Bladderwrack sprawls expansively across the rocks and reefs of its domains in the sublittoral zone, intruding occasionally on its neighbours’ territories (spiral wrack, knotted wrack, serrated wrack) and spreading its leaf-like fronds over sand and stones at low tide. A deep brown-olive-green, it is distinguishable from other wracks by the plethora of oval air bladders that cover its fronds, doubling up along the seam of the mid-rib where, dividing, they form tiny heart shapes before stretching into flat wavy leaves. The ‘bladders’ are of course this wrack’s defining feature and keep it afloat and steady in its rocky intertidal territory, allowing it to capture light for photosynthesis. The splays of leaves create a dense forest at high tide sheltering the hermit crabs, snails and anemones that share this zone. Known for centuries along the Scottish coasts as ‘tangle’ or ‘tang’, Bladderwrack has been an important part of the annual harvest, primarily as a source of manure for arable crops but also as a nutrient for farm animals. Used as the key fertiliser for early Jersey, Irish and Channel Isle potatoes, it is also the secret to growing early broccoli and is used as a slow release mulch to protect and nourish land over the winter. Burning tang releases potash and this can be (and still is) spread directly on the soil. In the Hebrides, they use the ashes to cover cheese and as a nutritious additive to fodder for horses, cattle and sheep. In fact, feeding seaweed to sick horses helps to cure them of their ails. A rich source of trace minerals, it helps their cartilage and connective tissue formation and increases anti-oxidation activity during and after exercise. In addition to these trace minerals, Bladderwrack contains algin, iodine, potassium, bromine, mannitol, beta-carotene, zeaxanthin, fucoidan and mucilage, and has been used in traditional herbal medicine to help people with underactive thyroids to lose weight. It is the iodine that works on the thyroid and this in turn increases fat-burning and cellular metabolism, helping to boosting stamina and stabilise cholesterol and blood glucose levels. It can also be useful in reducing the inflammation caused by rheumatism and rheumatoid arthritis, reducing arteriosclerosis, helping cure bronchitis and emphysema. and is good for boosting the immune system. Like the big Laminarias (kelps) it useful in treating skin diseases, burn and insect bites. Not surprisingly recent studies have found Fucus vesiculosus to help women with abnormal menstrual cycles and it is believed to help reduce the risk of estrogen-dependent cancers, i.e. those related to women’s sexual organs. Studies show that Japanese women, who regularly eat seaweeds (and soy) have a much reduced risk of these cancers (and some research points to the presence of fucoidan, a sulfated polysaccharide found in Bladderwrack as the cancer inhibiting agent). It can also provide relief from severe PMS. Other studies show that an iodine deficiency in pregnant women can result in poor brain development in their children too – again because iodine is used by the body to build hormones. A report by Dr Alex Richardson (broadcast on Woman’s Hour, 23 Oct 2013) suggests that over 2/3rd of pregnant women in the UK are deficient in this essential element. Of course iodine is also a vital nutrient for the prostate, so I assume it would be beneficial for men too. Traditionally Bladderwrack for medicinal use is gathered near the end of June, before it reaches full maturity, and then dried in the sun till brittle enough to grind to a powder. It can be hung on racks to encourage it to dry rapidly, but should not be dried by artificial heat or it will lose its hygroscopic qualities. Any seaweed washed up on the shore or beach is not suitable as it will have lost much of its vitality and key constituents. 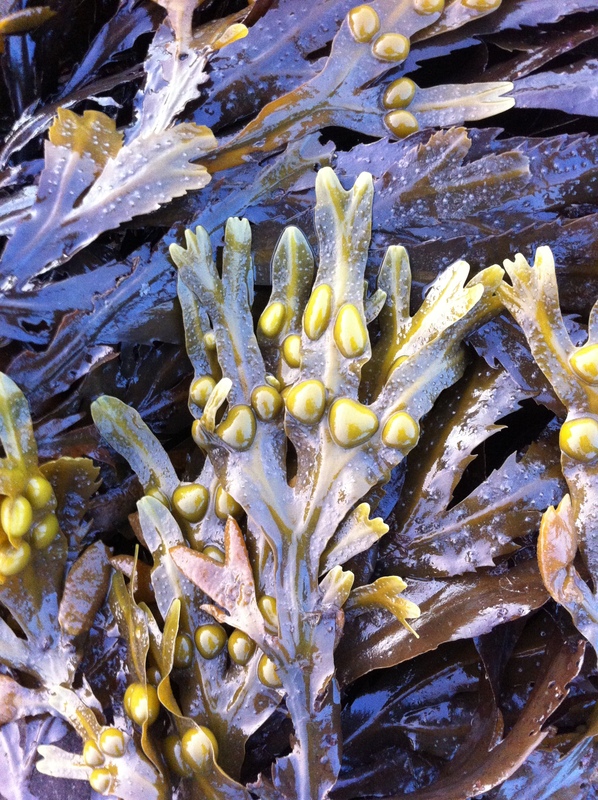 Bladderwrack can be taken in powdered form, as an extract or tincture, added to soup and stocks, or made into a tea – the stem, roots and leaves should be used. Fresh bladderwrack (from clean shores, of course) can be put directly into a bath and makes a wonderful soft skin scrub (put it on the compost when you’re through! ).